In an exploration into how games can add value to the innovation process, Philips Design has created ‘Spark’, a board game that stimulates creativity and innovative thinking. 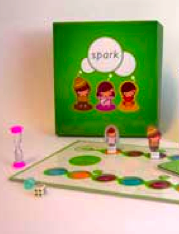 To play Spark, the players move counters representing different characters around the board, with each space along the way describing a certain situation. By considering the potential outcomes for the particular character and situation, a lot of genuinely creative and even ‘out of the box’ ideas are generated. These are used to enrich insight generation during the workshops. The game has proved so successful that there is talk of developing versions for other regions (at the moment it is targeted specifically at Europe) and also using it in other sectors within Philips. Philips Research meanwhile has created SimplicityLabs as a testing ground for upcoming technologies and applications. It is a place where users can see, evaluate and contribute to new interaction concepts. It allows the company to get user feedback early on, and to improve their applications to suit user needs, well before they hit the market.